In double-hung units, both sashes slide vertically. Ventilation area can vary from a small crack to an opening of one-half the total glass area. Both sashes should tilt-in for easing cleaning. Multiple double-hung units can be factory mulled. Both sashes slide horizontally in a double-sliding window. Maximum ventilation and easy cleaning with swing-in style sliders configurations are in 2 or 3-lite units. Casement windows are hinged at the sides. Casements are extremely airtight and have internal screens. Casement windows project outward, providing significant ventilation. Because the sash protrudes from the plane of the wall, it can be controlled to catch passing breezes. Configurations can be a single casement to a combination of 6 units. Awning windows are hinged at the top and open outward. Screens are placed on the interior of the window unit. Awning styles can include a transom for additional viewing area. A bay window is made up of three or more windows. The side or flanker units project out from the building in 30, 45, or 90 degree angles. The center is parallel with building wall and is made up of one or more windows. All the units can be stationary, operating, or any combination thereof. A series of four or more adjoining window units, commonly five in number, installed on a radius from the wall of the building. All units can be stationary, operating or any combination there of. Designed to protrude from exterior walls to allow for a deep seat to house plants. Maximum sunlight via glass top. For ventilation the side glass opens. Refers to windows that are non-venting or inoperable. Can typically be larger than operating units. 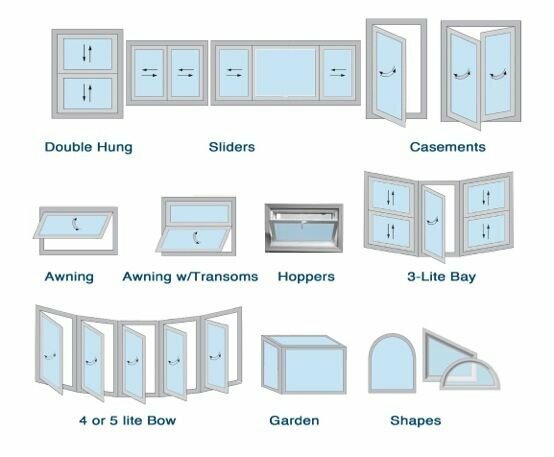 Best suited for basement location or area where a small opening needs a window. Windows pull in to open and have exterior screens. Are fixed lites above or below any window style. Circle tops are 1/2 the radius of a circle. Eyebrows are less than 1/2.